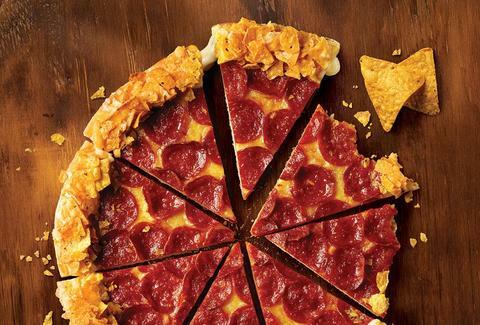 Just when you thought they couldn't possibly put more corn chips on a pie (we're looking at you, Papa John's), Pizza Hut Australia goes down the same route as Taco Bell and integrates Doritos into its menu -- with the Doritos Crunchy Crust Pizza. Hard to believe this didn't happen in America first, huh? The pizza's crust is dangerously cheesy (just like the next snack food we want to see on a pizza, HINT HINT) and audibly crunchy, consisting of mozzarella cheese covered in original Doritos chips and sprinkled with cheddar. You can apparently get anything on their menu with a Doritos Crunchy Crust for $3 extra, and it's kinda like getting pizza and nachos at the same time. With any luck, we'll be seeing (and hearing) this stateside sometime in the near future. Adam Lapetina is a Food/Drink staff writer for Thrillist, and is going to experiment with putting Flamin' Hot Cheetos on his pizza later. Read his musings at @adamlapetina.